I got a CAA membership a few years ago, and I’ve had it ever since. It was recommended by my car insurance company when I bought an old car. They said it is a good safety measure for road trippers like us! And with reason! One day I was driving on a highway with my daughter and mom. It was heavily raining. My wipers stopped working. I was scared to death! I was 150km (about 92 miles) away from home. Luckily with my CAA membership, I was towed back home, free of charge. But CAA is not only for car towing services only (which I used to think). It offers interesting reward and saving programs that can help you save money! 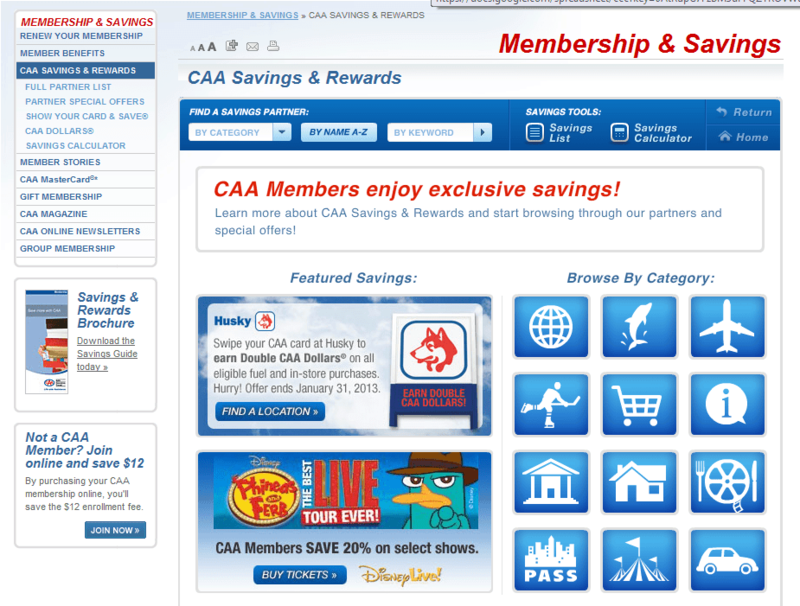 CAA membership features many savings in different areas! If you are not a CAA member, you can join today online and save $12 on your membership! Not a member yet? Join CAA Today! Happy saving! CAA membership offers car towing services and help when you forget your keys in the car! It also offers exclusive savings in different fields: travel, entertainment, automotive, shopping and more! We enjoyed these savings and rewards when we traveled from Montreal to Florida! When we planned our road trip, we sought the help of our CAA store. They provided us with a personalized map as well as city books! In each book, we had a description of the major attractions in the city as well as the CAA savings and rewards. We discovered that the membership provided us with 20% on all Best Western hotels even in the US. We organized our stays in all those hotels. When we didn’t find a Best Western we stayed at Hampton inn where we had 10% off. You can browse the rewards and the savings by the category you want: travel, leisure, sports! One of the savings that caught my eyes was the 20% on Disney Live! , Disney on Ice and Monster Jam tickets. With a 5 year-old princess and the holiday season around, it would be a great way to have fun and save money on her favorite shows. Disney Live! 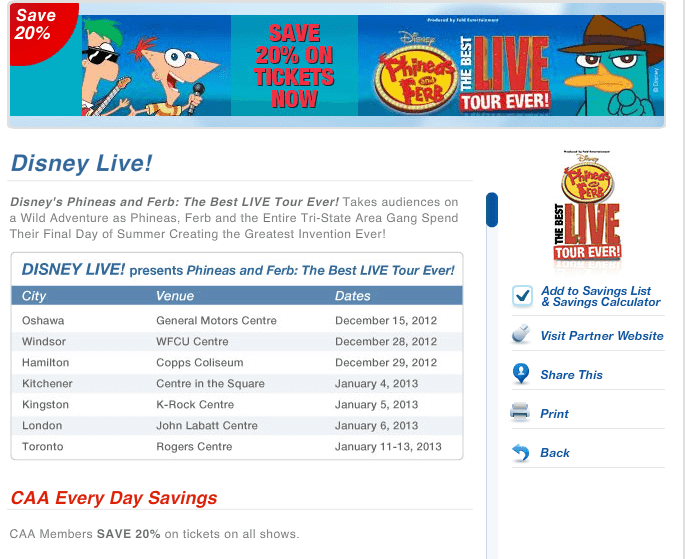 will be presenting Disney’s Phineas and Ferb: The Best LIVE Tour Ever! all around Canada until January 13th 2013. Just visit the Disney Live! site and enter your CAA card number to be eligible for a 20% discount! The Disney on Ice shows will be running in January and March 2013. What a great spring break activity! You can also get the 20% discount! Another interesting discount that would please my 11 year-old son is the 30% Off on Harlem Globetrotters tickets. Whether it is for travel, entertainment, dining or other services, a CAA membership offers exclusive savings for its members as well as rewards. Every time you use your CAA card in participating partners you can earn 20% in CAA Dollars. Last year, I earned enough rewards to pay 50% of my yearly membership! Besides, the CAA membership reduces my insurance monthly payment. You can use the rewards to book your next travel or even to give the gift of membership. Those savings and rewards will help you save money, ease your budget and have fun with your family! Believe it or not I only JUST got membership to CAA. I didn’t realize it was more than just roadside assistance either. The added perks were what convinced us to join. Love that we are able to save on everyday stuff! Thanks for this! We’re members and for the longest time didn’t even know about any of the perks they had aside from roadside assistance! I learned a lot from chatting with CAA at SCCTO too! My in laws are the ones that got us into CAA. I absolutely love them and the services they offer, especially that towing and road side assistance. So worth having! I cannot tell you how much I rely on my CAA membership. I was at the hospital just before my dad passed away and I wasn’t paying attention to the fact that I had the lights on, the radio on and the heater. To say the least, my battery ran out. CAA came to the rescue again…quickly and without fuss. I love their awesome customer service! Our memberships (which we’ve had for YEARS) have always provided a sense of security but honestly it’s saved us money often. Between tows and movie tickets we use it often…..hopefully no more tows! Thanks for your tips about how to save with a CAA membership. We’ve had a membership since forever, and I am still learning about perks and bonuses surrounding the card. You’re welcome! It’s always great when you find out that something you use to save money can actually save you even MORE money! Thanks for sharing, I have never heard of CAA. I am all about anything I can use to help save money. I will be checking out CAA for sure! It really is a great thing to have! I used to forget my keys in the car A LOT when I was a teen. It would have been great to have had this! Yes, it’s definitely a must for situations like that!! That is great that they give a reduced rate at all of those shows! Thanks for the info. I’m trying to save money wherever I can. Thanks for the reminder to update my membership that expires on December 31st! I was actually a member for years and didn’t even know about any of the perks they had aside from Roadside assistance, so glad I know now!